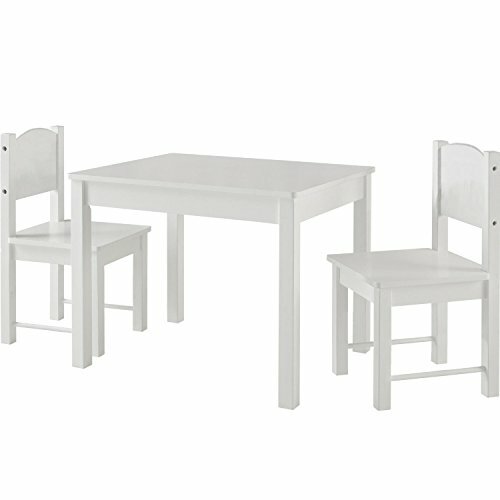 White stylish wood kids table and chairs set. Great for kids many different indoor and outdoor activities. Our wooden Table and 2 Chair Set is the perfect place for coloring, playing board games, and arts and crafts. With a square table, and two matching chairs, kids will love having a place that is perfectly-sized for them. As darling in the dining room as in your child's bedroom, this table and chair set offers little ones a place to sit that's just their size. It'll soon become the favorite place for doing art projects, having snacks and more. Set includes a table and 2 chairs. This Kids Table and Chair Set is made of solid hard wood, Ideal for your toddler's bedroom, playroom, or the living room. If you have any questions about this product by Timy, contact us by completing and submitting the form below. If you are looking for a specif part number, please include it with your message.